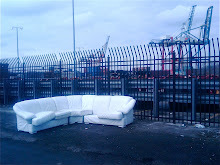 A View From The Hook: Red Hook Welcomes the Dutch Flat Bottomed Boats ... and the Opportunity to Access the Waterfront. Red Hook Welcomes the Dutch Flat Bottomed Boats ... and the Opportunity to Access the Waterfront. 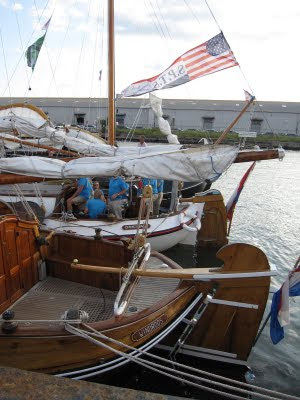 Yesterday, in an event organized in collaboration with the New York City Economic Development Corporation, the Port Authority of New York and New Jersey and PortSide New York, the community of Red Hook welcomed a fleet of twenty historic Dutch "flat bottomed" boats as they entered the historic Atlantic Basin and moored at their temporary home in Brooklyn. This was part of the larger NY400 Celebration commemorating the Quadra-centennial of Henry Hudson’s voyage into New York Harbor. It was a great opportunity for New Yorkers from Red Hook and beyond to see the beautiful 19th Century boats, welcome the Dutch crews and to have the chance to access the waterfront that is right at their doorstep. As you can imagine, the residents of our neighborhoods welcomed this opportunity with great enthusiasm and turned out in large numbers to attend the event and to experience the waterfront in this exciting way. For me, a Red Hook resident who has lived mere footsteps from the Atlantic Basin for nearly 8 years, it was the first time to have the opportunity to walk through the gate and view the Atlantic Basin and the visual delights offered within and beyond with my own eyes. 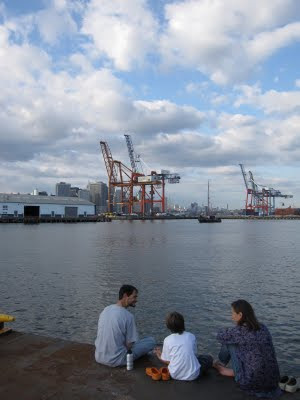 With the lower Manhattan skyline as a looming backdrop, framed by the cranes of the Container Terminal, through which you could see up the East River to the Brooklyn Bridge and the Empire State and Chrysler buildings glistening in the sun beyond, the flat bottomed boats entered the protected harbor of the Atlantic Basin one by one through the entrance to the Buttermilk Channel - the narrow passage between Red Hook and Governor's Island, seemingly a stone's throw away. 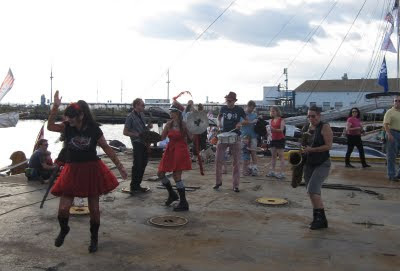 As the fabulous "Hungry March Band" played their baritone sax driven funk, the boats and their crews were greeted by the many onlookers - waving, taking photos and cheering them as the boats hoisted their colors and sailed into their temporary safe harbor. Pier 12, home of the Brooklyn Cruise Terminal, sat between the moored boats and the channel outside, with the Statue of Liberty peering over the top of the fence on the Southern side of the basin. The Dutch visitors mingled with locals and local community representatives who were there from the Red Hook Civic Association, Red Hook Houses and others, as well as representatives from the EDC, Port Authority and other dignitaries. People walked along the basin's edge, beside the Pier 11 shed (recently leased to Phoenix Beverages for beer storage), a part of which is planned to be the new home of Portside's operations, and took in the amazing sights and views of the city. In front of the shed there were locally supplied snacks and more musical entertainment provided by local resident, J.E. McKnight - in all a very festive occasion. Some speakers were slated to say a few words about the event, however, my family and I (with some of my neighbors) had left our block party to attend, so after an hour or so we walked the few minutes back to the block and our more modest affair, missing the speeches. Lehrer spoke to experts on waterfront development, one being Bert Hooijer, professor of applied science at Rotterdam University in the Netherlands, who is in New York as part of the "H209 conference, a Trans-National Look at Modern Urban Water Challenges" - another part of this larger Henry Hudson NY400 celebration. Professor Hooijer spoke of developing the waterfront in the "right way", with "multiple functions". He said the goal was to "get people to it" and to "combine several disciplines" to "develop the waterfront in a new way." Professor Hooijer went on to say, "the most beautiful thing to do is to bring the people to the water ... bring the local people to the water ... give people activities to do on the waterfront side" and "on the water" and to "use the quality of the people which (sic) are living next to the waterfront." I was thinking about these remarks when I was down at the Atlantic Basin. I think this event, as evidence of what the Dutch professor what talking about, showed what will happen if our neighborhoods are presented with, as with events such as these, the opportunity to access and interact with their waterfront. They'll come, they'll embrace it and their presence and input will add to the richness and liveliness of whatever is happening. 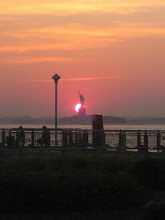 In that way, with this event, the EDC, Port Authority and PortSide succeeded.